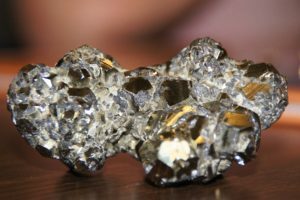 Geology ROCKS is one of my favorite activities to share with kids. 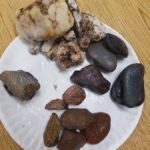 It is usually easy for teachers to find rocks to bring into the classroom for this activity. 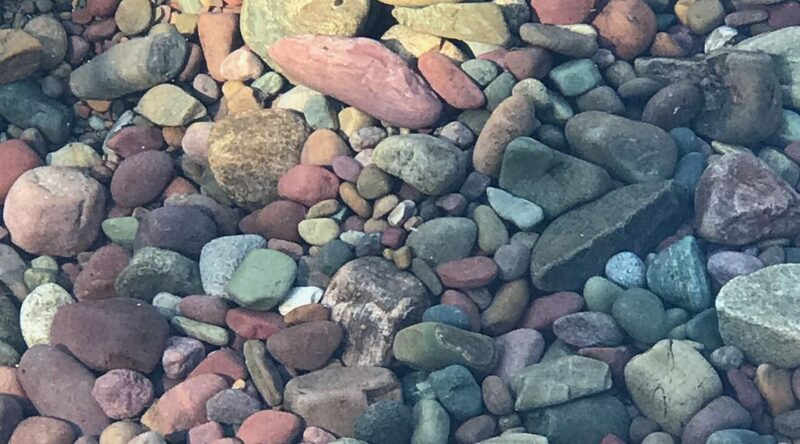 If you can’t collect rocks in your neighborhood or nearby park then consider visiting Home Depot or a landscape company to purchase river rock. And of course, there is a selection of rock collections on the internet. 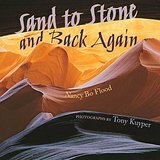 One of my favorite books to introduce geology to children of all ages is Sand to Stone and Back Again written by Nancy Bo Flood with photographs by Tony Kuyper. Narrated by the sandstone itself, the word poetry matches the incredible images of landscapes and rock formations of the Southwest. 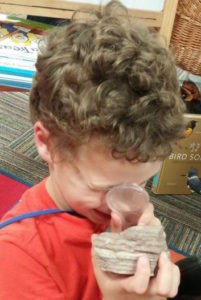 I introduce rocks to children by showing them how to use a hand lens so that they can look closely at the grains of sand, multifaceted crystals, tiny shells or pebbles that make up their rock. Notice that the proper way to use the lens is to hold it up to the dominant eye and bring the rock into focus by moving it up to the lens. 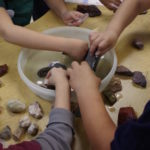 Encourage your children to be “rockhounds” by challenging them to sort a bucket of rocks. 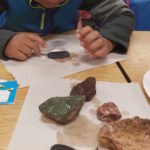 By looking closely at the color, texture and hardness, children will be using skills that a geologist uses in classifying rocks. Dipping rocks in water helps the color deepen (and it’s great fun for the kids!) After one attempt, challenge the students to use different characteristics to sort again. There are many writing activities that complement the rock investigation. 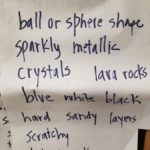 I find it important to help students create a word bank and so I start with sensory words. 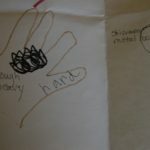 Students can create a foldable with the picture of each sense at the top of a column and then add their “sensory” words in the proper area. Or after your investigation, you can brainstorm “rock” words for a word chart. Recording the information in a nature journal is the work of a scientist. I’m not concerned with identifying the rocks. I want to give students the tools to be more aware and to look (or touch) closely. These books are exceptional mentor texts for creative writing activities. 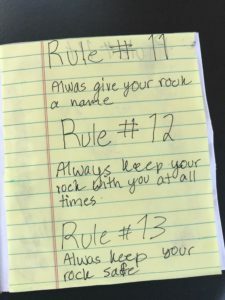 After reading Byrd Baylor’s Everybody Needs a Rock, students can write Rule #11 for finding a rock. Diana Hutts Aston and Sylvia Long pair up to create a verbal and visual masterpiece in A Rock is Lively. 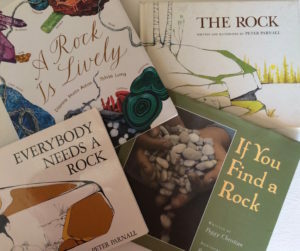 The unusual descriptive language will cause the students to think differently about rocks (“a rock is mixed up” or “a rock is galactic”) while they marvel at the incredible illustrations especially the colorful endpapers. And, of course, there’s accurate scientific information too. 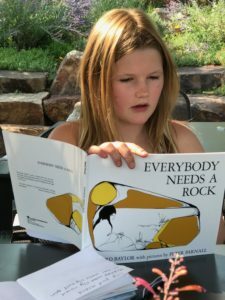 A fun way to conclude your study of rocks is to read aloud If You Find a Rock by Peggy Christian. It begins with “If you find a nice flat, rounded rock that sits just right in the crook of your finger, then you have a skipping rock. You toss it out in the water just so and see it trip across the surface, making a chain of spreading rings.” (Did that image take you back to your childhood days like it did for me?) She then goes on to describe a resting rock, a hiding rock and even a worry rock. 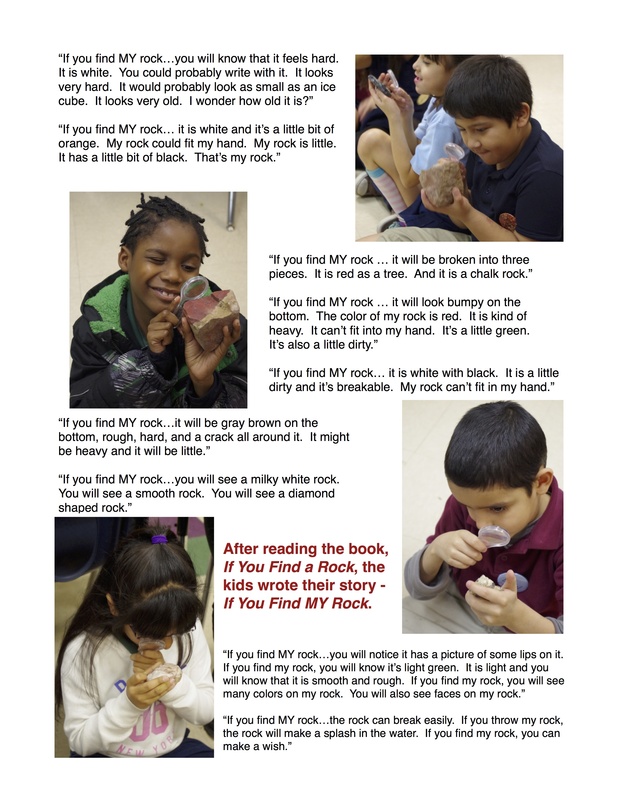 After reading the book, each student chooses their rock and writes a description of it – “If you find MY rock…” so that after reading it, I can pick out their rock from the pile on their table. If successful, they get to take their rock home. 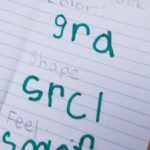 Here is the writing of second graders that participated in my after school Writing from Nature camp.